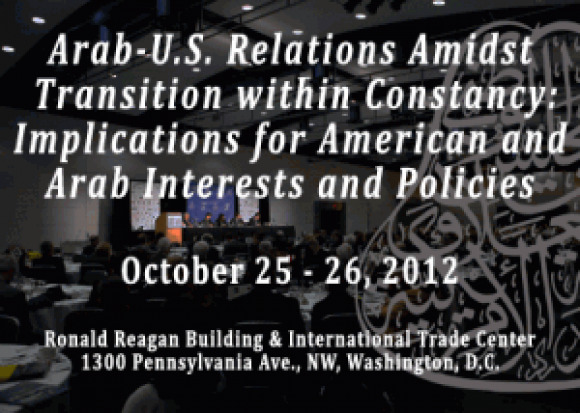 Chas Freeman, President Obama’s controversial pick for National Intelligence Council chairman, was the keynote speaker at the 21st Arab-US Policymakers Conference, or AUSPC, organized by the National Council on U.S.-Arab Relations, and held on October 25-26 in Washington, D.C. Freeman withdrew his nomination when critics noted his connections to a Chinese state-run oil company and his backing from the government of Saudi Arabia. He had been criticized for making anti-Israel statements and blamed the “Israel lobby” for his failed nomination. Even more controversial than Freeman, however, was Jeffrey Steinberg, who spoke to this year’s gathering during a panel discussion on “The Palestinian Future.” Steinberg, a close associate of convicted felon and political extremist Lyndon LaRouche, advocated an “American Spring” to change U.S. policy toward the Arab world, including by recognizing Palestine as an independent Arab state with full U.N. membership. Despite the anti-Israel nature of the event, this year’s AUSPC was sponsored by various American Big Oil companies, the U.S. Chamber of Commerce, and U.S. corporations such as Boeing. The government of Saudi Arabia and other Arab states were also major sponsors. The ADL stands for the Anti-Defamation League, which labels LaRouche, who began his career as a Marxist, a “notorious American anti-Semite.” Executive Intelligence Review is his publication. LaRouche is considered the intellectual author of the 9/11 Truth movement because he questioned whether Arabs or Muslims had staged the attack. He said about 9/11, “I don’t think this is an Islamic national operation. I would say the capability, and the motivation, for the intention, does not come from the Arab world. And the isolated Arab groups, which might intend to do something like that, don’t have that capability.” These comments were made in a radio interview that is still available on a LaRouche website. LaRouche and his current and “former” associates frequently make the assertion that Islamic terrorism does not exist and instead is sponsored by Israel, the U.S. or Britain in “false flag” operations designed to make the Arabs and Muslims look bad. This panel discussion with Steinberg was covered by the C-SPAN television network, but the moderator of the panel did not mention the more controversial parts of Steinberg’s biography. The moderator was Alison Weir, President of the Council for the National Interest and Executive Director of the group, If Americans Knew. Other speakers were Dr. Sara Roy, Senior Research Scholar at Center for Middle Eastern Studies at Harvard University; Dr. Tamara Sonn, the Wm. R. Kenan Distinguished Professor of Humanities at the College of William and Mary; and Mark Perry, author of Conceived in Liberty, The Last Days of the CIA, and Talking to Terrorists: Why America Must Engage its Enemies. Steinberg has been a guest on foreign propaganda channels such as Iranian Press TV, where he appeared “on the International Quds Day in support of the Palestinian resistance against the Zionist regime’s occupation of Palestine,” according to the official description of the program. International Quds Day is designed by states such as Iran to condemn the state of Israel and call for its destruction. Corporate and Institutional Sponsors of the conference on the so-called diamond, platinum, and gold levels included the HRH (His Royal Highness) Prince Alwaleed Bin Talal Foundation, Aramco Services Company, The Boeing Company, Chevron, Connoisseur Travel, ConocoPhillips, Embassy of the Kingdom of Bahrain, Embassy of the Hashemite Kingdom of Jordan, Embassy of the State of Kuwait, Embassy of the Sultanate of Oman, Embassy of the State of Qatar, Royal Embassy of the Kingdom of Saudi Arabia, Embassy of the United Arab Emirates, ExxonMobil, Federation of the GCC Chambers of Commerce, Marathon Oil Company, Qatar Airways, Oxford Business Group, Saudi Basic Industries Corporation (SABIC), United States Chamber of Commerce, U.S. – U.A.E. Business Council, The Washington Diplomat, and The Xenel Group.